3-0 in the league on Saturday, at least 3-0 in each of their last three in this competition – what’s to say a similarly resounding scoreline tomorrow night won’t nudge this blossoming Blues outfit along the path to making it Mourinho 3 Wenger 0 on the European cup count? Chelsea arrived in Switzerland today to take on FC Basel, mindful that a draw will see progression to the knockout rounds confirmed, while a victory will guarantee Group E’s top spot, courtesy of the club’s superior head-to-head record against second-placed Schalke 04. With Basel four points back on their visitors, they will be desperate to replicate their shock success at Stamford Bridge on Matchday 1 and extend their unbeaten sequence against English opposition to five matches. But if Chelsea can exact revenge for that capitulation and lay to rest the ghost of only Mourinho’s third home defeat at the club, a third successive win on their Champions League travels would surely banish any fears that the overall strength of this squad cannot compensate for its obvious lack of depth in certain departments to give the Special One a third trophy and a place among the coaching pantheon in his home country next May. September’s remarkable reversal has provoked a determined reaction; the Blues rattling off three consecutive wins, all with at least three scored and with three clean sheets to boot. Contrastingly, the Swiss Super League leaders have not converted their opening show of intent into a position of safety, having picked up two further points in their hat-trick of subsequent outings. With Arsenal simultaneously looking set to cement their feet at the end of their own bespoke long-jump pit, standing, as they do, atop both charts and a mere home win over Marseille off emerging unscathed from a testing pool, one can almost sense the hint of an unfamiliar outcome north of the river. Don’t be fooled; this is the time of year when Arsene’s men become little boys lost and an alleged era of advancement is invariably downgraded to a term of transition – a period which could have been kicked off by the Blues’ cruise in the Capital One Cup last month, only for a failure to kick on to allow time to regain their fragile, Will Ferrell-esque composure. As early season promise gives way to mid-winter reality and temperatures begin to drop, from the Alps to the Emirates, perhaps the snowball effect starts here. To that end, a Petr Cech confidence-dent borne of fateful lapses cannot be condoned, any Ashley Cole resentment at an ongoing period of laying low will need to be risen above and Frank Lampard’s return to the scoresheet offered by his deployment further forward simply has to be capitalised upon. 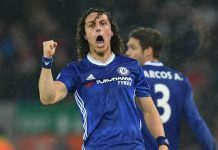 John Terry will be duty-bound to forge an impenetrable bond with committed yet limited understudy Gary Cahill, while the haphazard and often downright hazardous David Luiz sits out this encounter on the continent with a knee injury. The obligations of whoever starts out of the happily unholy trinity of Fernando Torres, now recovered from an adductor ailment, Samuel Eto’o and Demba Ba are plain: to relieve the goal-scoring burden from those behind them and to pose sufficient problems for opposition defences to offer the star turns requisite space to manoeuvre. Most importantly, a midfield containing any pairing among Lampard, Mikel, Michael Essien and Ramires plus, quite possibly, a more liberated Luiz must learn to become less predictable and work tirelessly to increase their ability to shift through the gears at any given moment. This will then allow the scandalously gifted trio ahead of them – for that is what any three-pronged combination formed from the attributes of Oscar, Eden Hazard, Juan Mata, Willian, Kevin De Bruyne and Andre Schϋrrle is – to perform their extravagant acts with a sturdy enough stage beneath them. The Swiss hosts will take the field without Wembley-conquering Chile midfielder Marcelo Diaz, who has a rib injury, but nevertheless boasting the attacking threat of Mohamed Salah, so impressive in the reverse fixture, along with the defensive talents of 21-year-old Fabien Schär; another towering presence for his side in SW6. Two from three doesn’t go, which we discovered amidst almost insufferable circumstances last season as our crown slipped to expose our weary heads to the ignominy of Europa League action. Our subsequent lifting of the trophy for the first and, hopefully, only time in our history included a semi-final defeat of Basel, who had accounted for Tottenham Hotspur in the previous round. This time tomorrow, the tables could turn, one way or another. Here’s hoping we knock ourselves out of the competition UEFA sent to face the corner, while the standings that matter remain intact. Bring on three more points and may Mourinho’s march on the Stadium of Light commence.